Natural language processing (NLP) technologies allows humans to interact with computers through conventional languages such as English and German instead of artificial languages such as Java and C++. These technologies use a computer to process, analyze, and generate computational linguistics on the basis of human languages. Currently, NLP technology is being extensively used in the healthcare industry as several public and private health organizations are using it for clinical applications. Hospitals and clinics are adopting these technologies to improve patient engagement and bring in efficiency in decision-making capabilities. Owing to these reasons, the global healthcare natural language processing market is expected to be worth US$4.3 bn by the end of 2024 from US$936 mn in 2015. Between the years of 2016 and 2024, the global market is expected to expand at a CAGR of 18.8%. The demand for NLP technology is expected to surge in the coming years as it is being used as a strategic tool to derive meaningful comprehensive of clinical informatics for effective outcomes by the healthcare industry. Used as a part of artificial intelligence systems, applications of NLP technologies are being deployed for predictive analysis and clinical decision support systems. The global healthcare natural language processing market is expected to receive an impetus from the uptake of these technologies by several companies for extracting knowledge from several clinic documents via machine learning or deep learning applications. The growing volume of unstructured clinical data and the unstoppable penetration of electronics health record (EHR) systems are expected to fuel the growth of this market in the coming years. On the basis of technology, healthcare NLP market is fragmented into machine translation, information extraction, automatic summarization, and text and voice processing. Out of these, the demand for machine translation and information extraction is expected to remain high in the healthcare applications in the coming years. The increasing influx of unstructured clinical information and pressing need for data analytics in clinical applications for text mining and document classification is expected to drive this demand. On the other hand, the text and voice processing segment is also projected to come across a plethora of opportunities in the healthcare NLP market. Factors such as growing adoption of speech recognition, and voice processing systems in EHR platforms, and artificial intelligence applications will boost the growth of the aforementioned segment. Geographically, the global healthcare natural language processing market is segmented into North America, Europe, Asia Pacific, South America, the Middle East and Africa, and Latin America. Presently, North America and Europe are leading the global market. The dominance of North America is attributable to the growing adoption of advanced technologies in healthcare applications and a strong foothold NLP technology providers. This regional market is also likely to thrive due to growing number healthcare organizations that are focusing on real-time analytics along with the integration of data analytics in various clinical processes. Furthermore, the growing investments by companies in developing improved NLP technology and artificial intelligence with the help of machine learning and automated decision-making support systems are also expected to drive the North America healthcare natural language processing market in the coming years. 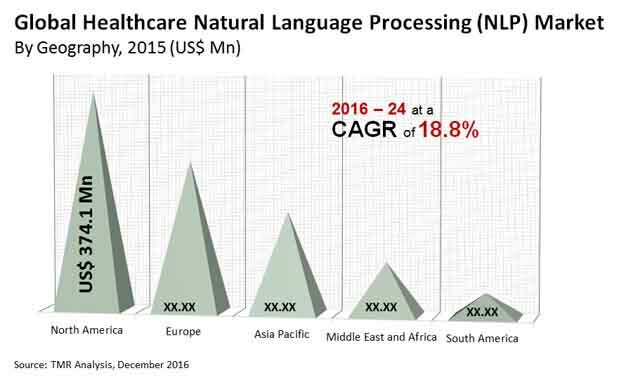 The key players operating in the global healthcare natural language processing market are NLP Technologies, Inc., NEC Corporation, Apple, Inc., Microsoft Corporation, Dolbey Systems, Inc., IBM Corporation, NetBase Solutions, Inc., SAS Institute, Inc., Verint Systems, Inc., eContext, Linguamatics Ltd., and Artificial Solution. Several companies are making terrific investments in developing advanced technologies and diversified solutions for healthcare applications. The global healthcare natural language processing (NLP) market has witnessed massive traction in the past few years and is expected to continue to expand at a promising pace in the next few years as well. This report provides a comprehensive overview of the key factors that could fuel this highly promising market, the factors that could hinder its potential pace of expansion, and the trends that would define its present course of development and its impact on the future of the market. The report considers 2015 as the base year for research and the forecast is provided for the years between 2016 and 2024. A detailed overview of the scope of the technological advancements and prevalent trends in the market is included in the report. The report includes vast data pertaining to key developments witnessed in the healthcare NLP market across key country-wide markets and the various opportunities that players in the market could exploit. The rising implementation of information extraction and machine translation technologies in the healthcare sector has emerged as a key trend across the globe in the past few years. This trend is anticipated to offer promising growth opportunities for the healthcare NLP market. Furthermore, the rising integration of network and data processing technologies such as internet of things and big data is anticipated to positively influence the overall state of development of the market in the next few years. The report states that one of the key driving factors for the global healthcare NLP market is the rising usage of electronics health records (EHR) across the healthcare sector. The mounting volumes of critical patient data fed through EHRs is making is necessary for the integration of effective knowledge extraction and processing systems. Being easier to operate as compared to systems that use computer languages such as Java and C++ to process, analyze, and decode data, natural language processing systems are gaining increased traction. Moreover, several countries in Europe are continuously increasing their spending on healthcare IT expenditure so as to improve healthcare infrastructures and incorporate advanced technologies in various diagnostic and therapeutic procedures. Healthcare organizations are increasingly making use of NLP technologies for effective documentation of clinical data and bring about a reduction in financial losses, incidental errors, and improve the quality of patient care. The report segments the global healthcare NLP market on the basis of technology and geography. On the basis of technology, the market has been segmented into automatic summarization, machine translation, text and voice processing, and information extraction. The report states that the segments of information extraction and machine learning are expected to emerge as the ones with the most promising growth prospects over the report’s forecast period. The report also presents a thorough overview of the market in the view of key regional markets. The regions analyzed for the healthcare NLP market include North America, Europe, Asia Pacific, South America, and Middle and Africa. Along with detailed analysis of growth prospects of the market in these regions, the report also presents an overview of the competitive and regulatory scenario concerning the healthcare NLP market. A significant rise in the number of development activities and vendors in the global NLP technology market focused on healthcare applications has led to a vast rise in competitiveness among players. The market is expected to remain competitive in the next few years as well, driving the steady development of innovative products from companies striving to outpace peers. Key companies in the global healthcare NLP market include are NLP Technologies, Inc., SAS Institute, Inc., Apple, Inc., Verint Systems, Inc., Microsoft Corporation, NEC Corporation, NetBase Solutions, Inc., Dolbey Systems, Inc., Linguamatics Ltd., IBM Corporation, eContext, and Artificial Solutions.